Not only did the county commissioners vote last month at the second sales tax hike public hearing against any sales tax hike referendum, they also voted to pursue Commissioner Sandy Murman's proposal to fund our roads and transportation needs within our growing existing budget. We are now in the FY2017 budget cycle and there is concern that county staff is not doing that nor putting forth a budget following the strategic direction they were told. In addition, the county was not providing ample opportunity for the public to weigh in with public comment on the FY2017 budget. That would be wrong at this critical juncture where the county must start appropriately funding our roads and transportation. I am Sharon Calvert and I live in Lutz, FL. I am concerned with the 2017 budget. After two public hearings, a majority of this Board said that transportation will be a top priority in our budget. Five weeks later I am concerned that the recommended budget does not do that. The Board voted, you gave direction, County staff must work to do that. For your vote to be meaningful, this Board needs to follow through and do what you said you would do, fund our roads and transportation now, starting with our FY2017 within the growth of our existing budget. This is a critical budget cycle. Yet there are no budget public hearings until September, way too late for the public to weigh in on changes to be made for this budget cycle. A budget workshop is scheduled for next week. I ask that the Board open that workshop to public comment. Otherwise, it appears there is lack of transparency and our critical budget process cannot be orchestrated and manipulated outside of Sunshine. The Administrator’s budget must stop growing by double digits. It is absurd that tens of millions of dollars of impact fee buybacks benefiting developers are somehow considered transportation funding. That is simply not being honest. Stop funding pet pork projects, stop funding those questionable and nebulous economic development projects, stop handing our tax dollars to special interests, or adding more parks to maintain, no more money to filmmakers and stop subsidizing the millionaires and billionaires - but start funding our highest priority - roads and transportation needs that have been neglected for way too long. For over three years, the county spent untold resources, time, effort and over $1.3 million telling the public that transportation is a priority. Now is the time for the Board to act and prove it. This budget cycle will confirm whether this Board has the fiscal discipline to reign in unnecessary spending and start appropriately funding our roads. The time is now to start enacting Commissioner Murman’s proposal to use the growth of our existing budget to fund our roads and transportation. Because continuing to hold our road funding hostage must stop now. Checking the BOCC calendar, we now find that the Budget Workshop scheduled for Tuesday afternoon and the Transportation Workshop scheduled for Wednesday afternoon have been cancelled. A Budget Workshop is now scheduled for Thursday, July 28, at 9am. The agenda and presentation for this meeting can be found here. From the agenda, it appears the county has opened this meeting up for public comment. Why is the county giving non-union county employees a 3.5% raise? That is a pay raise unheard of today in the private sector. Many of the county commissioners own constituents, who were negatively impacted by the last recession, are still playing catch up and are not receiving such pay raises. Our existing revenues have been growing at a rate of well over 6% per year the last few years, yet the county has refused to fund our roads. In FY2016 the county had over $100 million of new revenues, including over $40 million of new recurring revenues and the county refused to fund our roads. Where is the almost $23 million of BP oil spill settlement money going? Those funds have no restrictions on their use and can be used for transportation that has been neglected for almost a decade. The BP oil spill settlement money and the almost $62 million of estimated new sources of funds together add up to almost $95 million of new revenues for FY2017. There is no excuse for not funding our roads and transportation. Yet it appears the budget proposed by County Administrator Mike Merrill does not follow the direction given by the county commissioners last month. As our county revenues continue going up and up and up, Merrill again is refusing to appropriately fund our roads and transportation. Merrill continues to hold our road and transportation funding hostage while he has been growing his bureaucracy for years by double digits. This is fiscally irresponsible. The nonsense needs to stop. In the private sector, when the Board of Directors provides specific strategic direction to company management, management must follow the direction. If management does not follow the Boards direction, they are fired. There is a problem down at County Center that must be addressed. Merrill and his staff must work to accommodate the direction the commissioners gave him to start funding transportation within our growing existing budget. The entrenched bureaucracy must stop being obstructionists and do their job. The county administrator is an unelected bureaucrat not a policy maker. We do not have an elected county mayor. The county administrator cannot collude with a couple of commissioners to push their own or some special interests of theirs agenda. If county staff refuse to follow directions given them by the elected county commissioners, then the commissioners must find the proper staff who will. The county has wasted years doing absolutely nothing to fix our transportation. That is unacceptable. We demand better. It is time for the county commissioners to act. They must produce a FY2017 budget that starts funding our roads and transportation within our existing growing budget. The commissioners must rein in unnecessary spending and fund our roads and transportation needs first. If they refuse, transportation is not a priority for THEM. If they refuse, it confirms THEY cannot fix our transportation issue. If they refuse, the solution to the out of control ballooning budget and bureaucracy must come from the voters themselves. And We the People have the power to do it. Hogwash Sharon. You don't want existing road fixes, you want more new roads...including TBX. 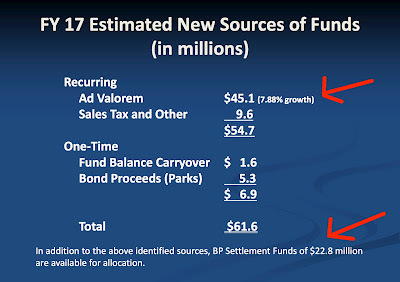 Tell me Sharon, how much money from Murman's so-called plan will be secretly funneled towards TBX? I know you will tell me none, but I know otherwise. Local taxpayer money funds local roads. State/fed dollars fund interstate projects like TBX and there are certain restrictions with state and federal dollars for what they may be used for. Hurling conspiracy theories is no defense for any position.